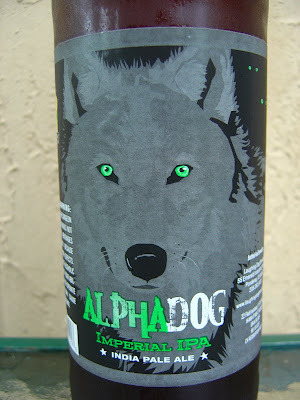 Tonight I'm drinking Alpha Dog Imperial IPA brewed by Laughing Dog Brewing in Ponderay, Idaho. Since I already published my Top Five from last month today, I was not even sure I'd be doing a review tonight. That was until I stepped into Total Wine and saw four new bottles from this brewery staring back at me. Actually the bottle I'm drinking tonight was staring at me! 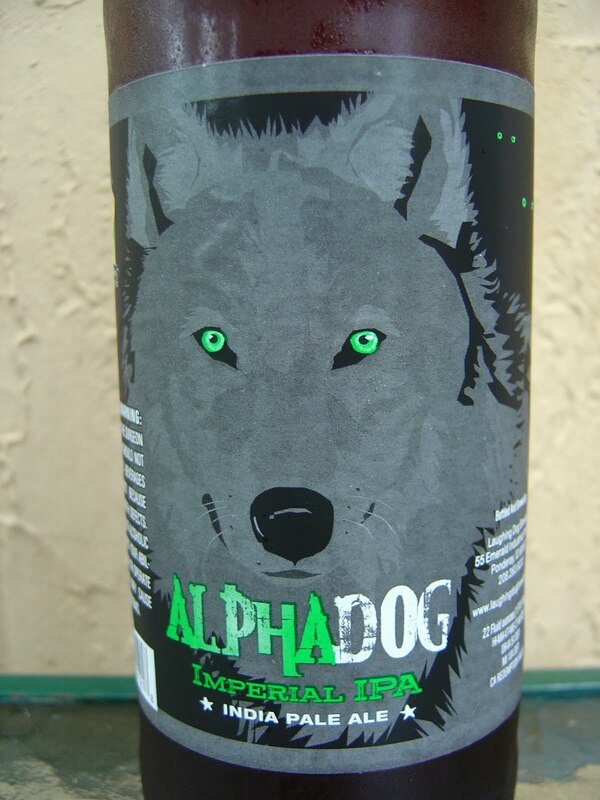 The wolf dog on the label has piercing green eyes, and his Beta, Gamma, and Delta pack are behind him, only identifiable by their green eyes in the shadows. So yeah, there's a new brewery in town. I knew they were coming for a while, but I was told it was a secret (and I'm good at keeping secrets). I didn't expect to see them so soon, either. I was caught off guard, which is nothing new. So I grabbed the first bottle of each beer, and therefore spent a bunch of money. Hmmm. Big head, very big indeed! The aroma starts out bitter with the pop of the cap but that is subdued a bit by some sweet tropical fruit and bready malt. Wow, the flavors lean way more toward the bitter with lots of pine and an amazing amount of citrus. Tangerine, orange, lemon, you betcha! Some bready sweetness does eventually tone down the initial bitter blast. Second phase, spicy and acidic, with a bit of burn from whatever level of alcohol is in this dude (bottle doesn't say). The alcohol continues on, drying things out considerably and leaving a medicinal taste in my mouth. That, my dears, was the worst part. Great medium carbonation. Not a bad beginning for Laughing Dog! Can't wait to try the other three. I love wolves and I love the green piercing eyes! Have to admit that I got very curious when you tweeted the link to me haha. It was a mysterious tweet you know. 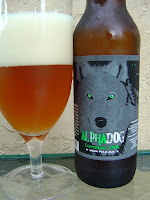 But this beer sounds ehm well...a medicinal taste, that doesn't sound tasty. I know that I can't really know this until I try. I just have a feeling I would pass out or run in a circle or well do something weird. Yes. I can see it vividly in my mind now. Hooray for the new brewery that caught you of guard hehe. I knew you'd check it out. Question. Does everyone in the Netherlands have brown eyes? Or is there a lot of diversity. I know, strange question. When you get a chance to check out some of these beers, I'll make you a list. This probably isn't top ten. I knew they were on their way down here. Did they have Dogfather there? Yeah, Mike. And two others. I don't remember their names. I thought the general idea of Holland was blond hair with blue eyes. haha. But there's a lot of diversity. You have interesting questions you know. Or people do wonder about it, but they don't ask me. Why did you ask that specific question? I would love to have a list! I'm going to check if I can get a few of the beers here and give it to my dad for his birthday. Like a beer goodie bag. Don't worry, I shall try it out too. I don't know. Because of the eyes of the dog, I think. Your avatar shows you don't fit your own stereotype. Very true. Then again even though I'm born in Holland, I don't have Dutch influences. Wait, I shouldn't say that too soon, since both sides of the family have a lot of influences going around. Maybe Dutch is one of them, but I don't know it yet. What other beers did you get from Laughing Dog? I'm intrigued. And Dogfather, when it's released, should be down here too.